What actually are solid surface? Solid surface are a more contemporary class of materials used for making tops and bay windows. Their most popular use is as kitchen tops. They are in essence different from natural products like granite. They are artificially made substances in the sense that they are a result of artificially engineered processes. Quite often these contain polyester, acrylic and plastic. These are a new addition to the otherwise traditional material like wood, granite, and tiles etc. that were used to make kitchen tops. These surfaces have the greatest advantage of being artificially engineered. 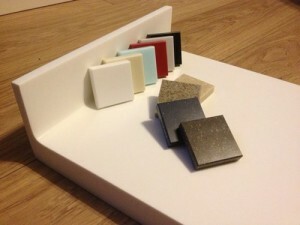 Most of the solid surface made today have acrylic and plastic as their primary contents. The more the proportion of acrylic, more is the durability and strength of the material. The plastic gives an added advantage to these surface in the sense that they can be moulded into any shape. Moreover, they can be developed into any kind of texture to suit the current market trends. Weight is quite a win-win factor in case of solid surface. For example, for substances like granite, the supporting structures like the kitchen cabinets need to be really strong so that they can bear the weight of the stone. Solid surface on the other hand can be easily mounted on any kind of structure. Even though they can be moulded easily, these surface are quite prone to wear, tear and abrasion. This means that they can be easily scarred by sharp edges like knives etc. They cannot imitate the strength and durability of granite and rock solid substances. To top it, they cannot withstand extreme temperatures. That is when exposed to continuous heat as is in the case of kitchens, they tend to fade quite fast and give a really old like appearance. As are the current market trends, the installation of these surfaces has become highly marketed quite much like the installation of kitchen cabinets. There is a certain degree of precision that is required during the installation process which can be obtained only by obtaining professionalised services. Quite often, people who are responsible for these installations also offer help on other fronts like the staron samsung material, colour, texture etc. As far as the colour and texture of the surface is concerned, you need to take care that it will go a long way in determining the look and ambience of your kitchen. To finally arrive at the perfect kitchen, you should always go for a colour and texture that complements your home decor. Solid Surface Bay Windows – Why Prefer Solid Surface For Your Bay Windows?